This week on Research Heroes we have Frank R. Kardes who is the Donald E. Weston Professor of Marketing at the Lindner College of Business at the University of Cincinnati. 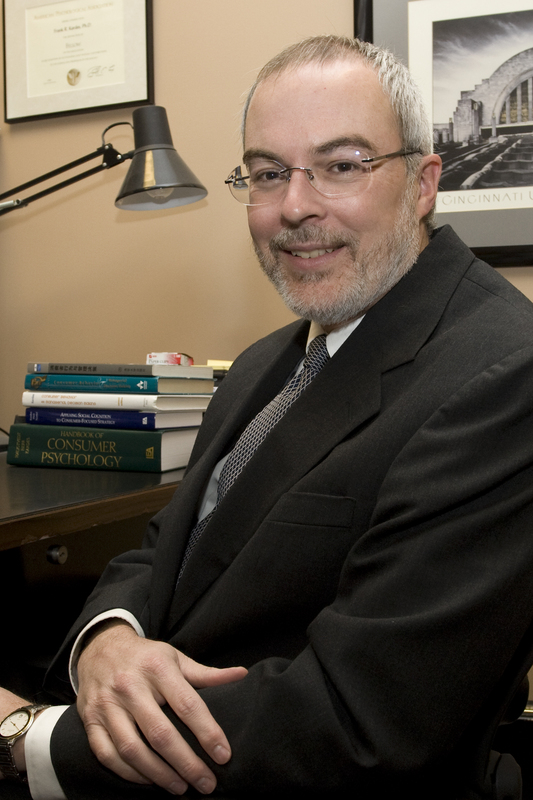 He is a recipient of the Distinguished Scientific Achievement Award of the Society for Consumer Psychology. His research focuses on omission neglect, inference, persuasion, judgment, and decision making, and he has published in many leading scientific journals Dr. Kardes is also a co-editor of Marketing Letters, former co-editor of the Journal of Consumer Psychology, Advances in Consumer Research, and the Handbook of Consumer Psychology. I wish someone had told me at the beginning of my career… I wish someone had told me to get ready to have a lot of papers rejected. To have a lot of papers accepted, you must also have a lot of papers rejected. Some of my best papers have been rejected and it’s often difficult to decide how to revise these papers and where to send them next. Everyone also seems to think that the submission process gets easier with age and experience, but it actually gets harder because the reviewers are younger and they have different research interests and different methodological preferences. Also, with age, distractions in the form of editorships, consulting projects, etc. increase. I most admire academically… My hero is Robert S. Wyer, Jr., because he is the greatest social psychologist and the greatest consumer psychologist in the history of the fields. He is the most prolific author in the history of social psychology and he has had the biggest ideas with the far-reaching implications (e.g.., information processing, accessibility effects, assimilation and contrast effects, on-line judgment vs. memory-based judgment). He has also been a big help to me personally, and we have a new chapter coming out in the Handbook of Social Cognition and we’re working on several research projects. The best research project I have worked on during my career… I really like nearly all of my research projects. One of my favorites is Deval, Mantel, Kardes, and Posavac (2013), which will appear in the April 2013 issue of the Journal of Consumer Research. This article presents 8 experiments showing how and when a wide variety of marketing tactics succeed and when they backfire. In each of the studies, success or failure depends critically on the naïve theories or assumptions that consumers use when interpreting marketing communications. The same marketing messages can either succeed or fail depending on which naïve theories consumers use. Importantly, most consumers have many naïve theories and they fail to recognize that some of these theories are contradictory. We investigated commonly used naive theories like price signals quality, promotions signal value, and technical information signals competence. The worst research project I have worked on during my career… I don’t think I regret any of my research projects. I’ve had some projects that I thought were based on good ideas, but the data were weak. Usually the quality of the data determines which journals I target. I still don’t mind publishing occasionally in less prestigious journals. Some of these projects were quite interesting, but the data were not particularly compelling. The most amazing or memorable experience when I was doing research… The project I learned the most from was my dissertation (Kardes 1988, Journal of Consumer Research). This project demonstrated that it is better to omit conclusions from ads and let consumers draw their own conclusions when they are likely to think about the implications of the information presented in the ad. When they are less thoughtful, it is better to present conclusions explicitly in the ads. I was using primitive response latency equipment. We didn’t have laptops back then. Incidentally, on some of my earlier projects, I had to punch data on cards using a teletype. One of my subjects told me that he was recently in a bad automobile accident and he suffered serious brain damage. To my surprise, his data were the same as the other normal subjects. This made me think that the dissertation ideas were even more generalizable than I had originally thought possible. The one story I always wanted to tell but never had a chance… I generated several dissertation research ideas before my advisor and I settled on one. He advised me not to pursue one of my earlier ideas because he thought that it would be too difficult to run this study. Many years later, I ran the study and it lead to one of my advisor’s favorite articles of mine (Kardes et al. 2001, Journal of Consumer Psychology). This study shows that a long stream of arguments is a house of cards that falls when one argument is attacked. However, when several independent sets of arguments imply the same conclusion, the conclusion is much more resistant to attack. A research project I wish I had done… I usually pursue most of my ideas eventually, although I sometimes wait years. If I wasn’t doing this, I would be… I’d probably be a sommelier or a chef. I’m a wine connoisseur and a foodie. The biggest challenge for our field in the next 10 years… Bridging the gap between theory and practice. Pressures to conduct applied research seem to increase every year, but without theory, the field of consumer psychology would be lost. My advice for young researchers at the start of their career is… Be persistent. Everyone gets rejected. Learn to write effectively. Writing for academic journals is different from writing for any other outlet. This entry was posted in Research Heroes and tagged kardes, research heroes by Elina Halonen. Bookmark the permalink.